No time for hassles at the entrance. 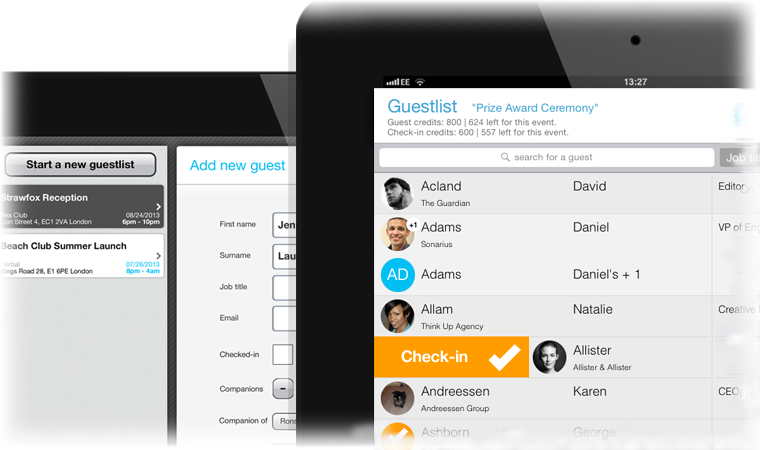 Benefit from the perfect guest list app. "The app was great, easy to set up and use on the day." "We are impressed with the quality of the app. 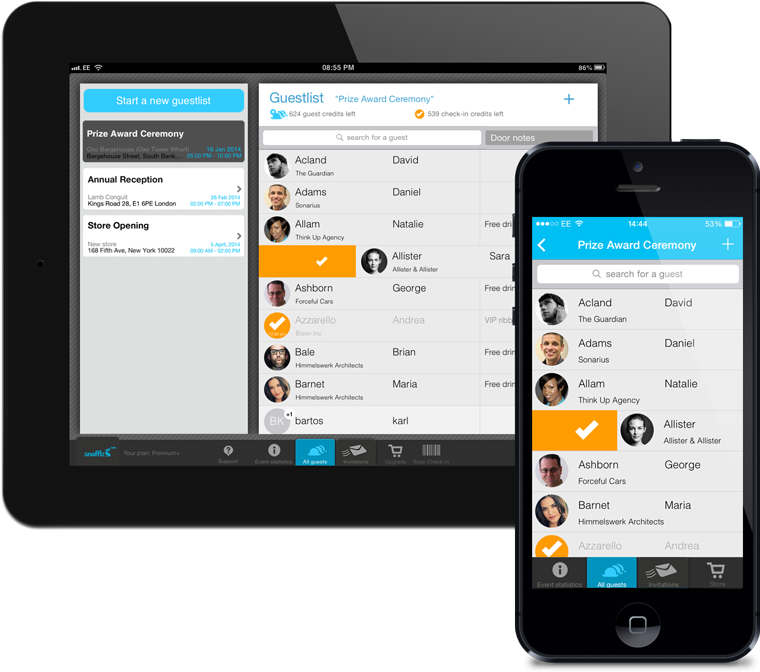 Snafflz brings our contacts, invites, guest lists and event admin under one roof - on desktop and mobile devices." "We were looking for a solution that could handle a VIP guest list for a store opening and an afterparty which shared about half of the names of the VIP event. Snafflz just works great." "The app worked extremely well. Snafflz is super reliable and really well made. Simple to use, instinctive and easy to learn. The features are made exactly as I needed them." "For major concerts we're managing a corporate box with Snafflz and add guests to a central location. It's great that this can be done from our iPhones." Snafflz manages them on your mobile. 1. Sign up on the Snafflz web app and install the free iPad/iPhone app. 2. Create an event and simply import or upload guest data (e.g. Excel). 3. The app syncs with your event data. Register guests on iPad/iPhone or laptop. Add attendees, quick-search for registrations or read QR codes at a pace that spreadsheets can't match. Snafflz builds your final guest list automatically, ready for check-in. Enjoy immediate 24-hour access to your synced collaborative guest lists: accurate data, that's always up to date, across every device your team uses. Multiple user accounts and authorisation levels enable you to delegate and still ensure the strictest privacy policies. Fact: Your guest list has never been safer - it's all in the cloud. Snafflz SSL data encryption and device backups prevent permanent data loss. 1. Invite your guests with email invitations or a registration page. 2. All registrations are added to your guest list. 3. Capture data via custom questions. Benefit from extensive email capacity and customise invitations and registration pages. Compile guest lists efficiently with Snafflz: take advantage of automatically collected registrations. Monitor RSVPs coming in real-time. That means a guest list built quickly, and automated confirmation emails are sent out promptly. Time to say goodbye to your clipboard: with the mobile Snafflz check-in manager for tablets and smartphones a streamlined entry is guaranteed: find names in seconds and check-in guests with a swipe. 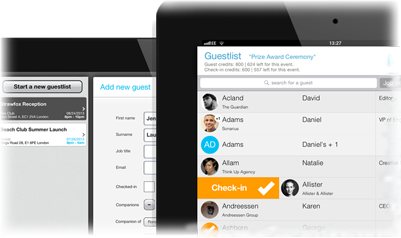 Amend your guest list directly on your mobile device, safe in the knowledge that all changes are synced across all devices. Receive live notifications of special guest's arrivals and gain insightful analytics: attendee statistics, time of arrival, guest profiles, loyalty etc. The Snafflz mobile guest list is bulletproof - online & offline. Tablet portrait mode offers an optimised check-in experience. Landscape mode is ideal for unintrusive data capture. A discreet screensaver protects your guest list from curious onlookers. advantage in event organising today. About Blog GDPR Terms Privacy Become a partner Work with us!